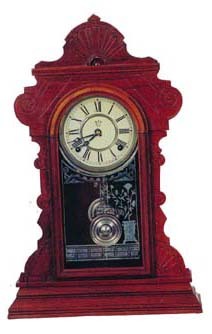 Waterbury Clock Co. "Suffolk", ca 1891. Walnut case was cleaned, polished, and loose pieces nailed tight. 2 small silver nail heads showing. There is about 90% of 2 labels on the back. Original and very nice glass, dial, and pendulum. 8 day, strikes half hours on a cathedral gong. Runs well. Overall a nice early shelf clock. Ly-Waterbury No. 1596.